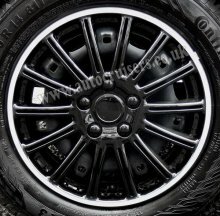 14" inch Gloss Black with White Ring Multispoke High Impact ABS Plastic Quality Car Wheel Trims. 4 Piece set. 14 inch, 4 universal wheel trims in a box. 15" Sport 7 Spoke Look Car Wheel Trims Hub Covers & Free !!! 14" Sport 7 Spoke Look Car Wheel Trims Hub Covers & Free !!! 13" Sport 7 Spoke Look Car Wheel Trims Hub Covers & Free !!! 15" Chrome Deep Raised Dish Van Wheel Trims Covers Set & Free !